This book is aimed at providing a concise discussion on the use of glycerol as a renewable raw material for the chemical industry. With the increasing use of biodiesel produced from oils and fats, there is a surplus of glycerol in the world. This abundant and rather cheap raw material can be transformed in commodities and specialty chemicals, as well as in fuels. The book describes the main processes of chemical transformation of glycerol, highlighting those that are currently in commercial use and pointing out potential processes to be used in the future. The first chapter introduces the concept of biofuel and briefly describes the production of biodiesel. It also highlights glycerol as the main byproduct of biodiesel synthesis and presents some numbers regarding the world production of glycerol. The second chapter shows the common uses of glycerol and addresses the point whether or not they can drain the large amounts of glycerol produced from biodiesel. The chapter addresses pros and cons of each use. The third chapter covers the main biotechnological processes of glycerol transformation. The fourth chapter thoroughly describes the main thermochemical processes to transform glycerol into commodities, products that will be further used in the chemical industry to produce polymers, for instance. The fifth chapter covers the production of glycerol derivatives of high added-value. 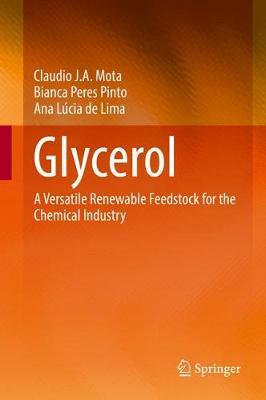 The sixth chapter addresses the use of glycerol in the context of a biorefinery. The main idea is to show that many of the processes described in the previous chapters could be entirely green, using exclusively renewable raw materials.